Hard Rock Stadium Shade Canopy – Adding a 14-acre shade canopy to the existing 30-year old Miami Dolphins NFL stadium…in one off-season. Blue Cross/Blue Shield Vertical Expansion – Adding twenty-five stories to an existing thirty story building in busy downtown Chicago…while the thirty story building was occupied. NASA Mobile Launcher – Modifying an existing rocket launch base to accommodate a new space launch system and vehicle program. A proud Hope College graduate and dad to a current Hope freshman, John is currently a Principal and Senior Project Manager with Ruby and Associates Structural Engineers in Metro Detroit. Ruby is a constructability-focused firm dedicated to serving the construction industry. 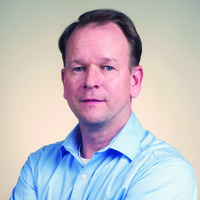 John celebrated his 25th year with the firm in 2018. After receiving his Bachelor of Science degree in Engineering Physics from Hope, John went on to receive a Master of Science degree in Civil Engineering from the University of Michigan. Since joining Ruby’s team in 1993, John served as leader of Ruby’s Building Design Service Sector, and has managed many of the firm’s most challenging and complex projects for healthcare, manufacturing, commercial and industrial clients. John is a member of the American Institute of Steel Construction; the Structural Engineers Association of Michigan, serving on the Special Inspections Guideline Committee; the Association of Iron and Steel Technology, serving on the Mill Building Operation Committee, and is a member of the Design-Build Institute of America. As a member of the Michigan Society of Professional Engineers (MSPE), John served as Oakland Chapter Membership Director and is Past President of the MSPE Oakland Chapter. He was awarded the 2001 Young Engineer of the Year Award from the MSPE Oakland Chapter.